The Ronin-S has made huge splash in the filmmaking community, no doubt about it. With the Ronin-S being DJI’s first single-handle gimbal stabilizer, many folks have been eager to put the product through its paces, and even push it to the extreme. The We Talk UAV team decided to take their new Ronin-S out to the streets of Barcelona to test out how well the gimbal performs in a real-world environment. Rather than doing some pseudo-jib shots and simple walk-and-talks, the team went completely bonkers by pushing the gimbal to its limit with shots that range from tracking movement performed on roller blades to inverting the camera for extreme low-angles flying near the pavement at high speed. And, here’s the result. The actual video begins with the host simply walking the middle of the street and the camera moving back with the subject. While this setup is rather typical for many gimbal users, the camera operator was actually wearing a pair of roller blades, slowly sliding backward on the bumpy road. Despite the amount of potential camera shake from trying to handle the camera on this particular occasion, the Ronin-S managed to eliminate most of the jitters seen in the shot, showing off what it’s truly capable of. The impressive stabilization abilities of the device can also be found in several tracking shots where a cameraman follows a car. Normally, filming a vehicle moving on the street would require another one with a camera mounted on it. In this case, they once again had the cameraman gliding along the road while following the car. As for the gimbal itself, the Ronin-S was able to capture amazingly steady footage despite the amount of rapid motion coming from the camera moving at a fast pace. If you thought the previous setups were impressive, how about the low-angle one of the We Talk UAV team? For some of these shots, the camera operator used one arm to hold onto a moving car, while his other arm held an inverted Ronin-S to get a low-angle car shot. Even with the gimbal in one arm, the Ronin-S didn’t struggle to keep the camera steady. 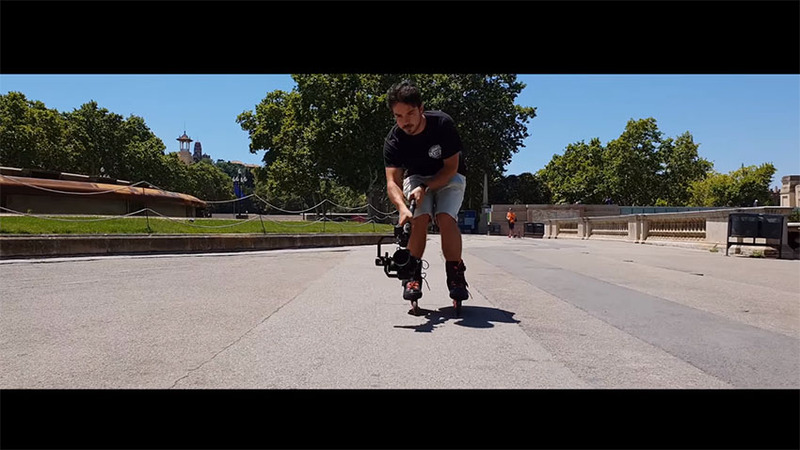 Although it’s not recommended that you use your Ronin-S while on roller blades, the video goes a long way in showing the gimbal’s ability to provide professional-looking footage even when handling the device in challenging situations. With an intuitive design and powerful hardware, the Ronin-S has all the bells and whistles required to provide you with stable footage even if you are not the best skater around.